If there's one thing I know, it's that black is always a winner. When I'm in a clothing rut, or just can't think up something new to wear, I revert back to black. In fact, my closet is is almost overtaken by my black dresses, tops and tees, but, what's one more piece to add to the collection? This linen number is the perfect blend between comfort and ease. It's great for slipping on and running out - errands, lunch date, stroll through the neighborhood? Check, check and check. And the fact that it's my color of choice these days? Done. 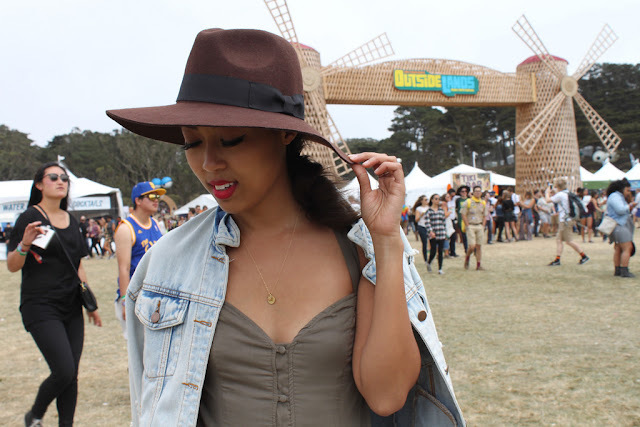 We made it to the third and last day of my Outside Lands outfit recaps! Hooray, hooray. On day three of the festival, I decided to go for another full length maxi, because why mess with a good thing? Typical to Chanda fashion, I couldn't help but finish off my look with a pair of comfy footwear (this time, OluKai's "Hema" leather sandals) and another signature hat (the bigger, the better). If there's one thing I love, it's this outfit combo. Day three was significantly cooler than the first two days - luckily my long maxi kept my legs covered up and I was smart enough to bring a thick denim jacket. Because I wanted to be as handsfree as possible for optimal dancing, I opted for a chic fanny pack, which also served as a belt for my dress. Two birds, one stone, folks. And boy did I dance. On day three, I caught my favorites: Odesza (seeing them again this December! ), Sam Smith, DJ Mustard (amazing.) and good ole Sir Elton John. Nothing like finishing off your night to some "Tiny Dancer." Aloha, friends! Day two of Outside Lands was a blast - good music, good hangs, good people, great food and just all around good, good vibes. Like most years, what I wear to the festival is a top priority. Outside Lands is a tricky one - it's hot (but not as hot as Coachella), cold ( the #fogust runs deep), and there's lots of walking from stage to stage, through dust and up and down mini hills. So, with each new year, I get wiser with my shoe selection and avoid anything that my feet won't be able to stand after an hour of dancing. This year, I was lucky enough to partner with OluKai and hang out with their at their beautiful #AnywhereAloha booth. For those of you who may not already be familiar, OluKai is a a Hawaiian leather footwear brand that rocks at making comfortable shoes and sandals made for adventure. And, if my five or so past years at OSL have taught me anything, it's that San Francisco's best music festival of the year is truly an adventure. If there's one word the majority of my pals would use to describe me, it's "sassy." 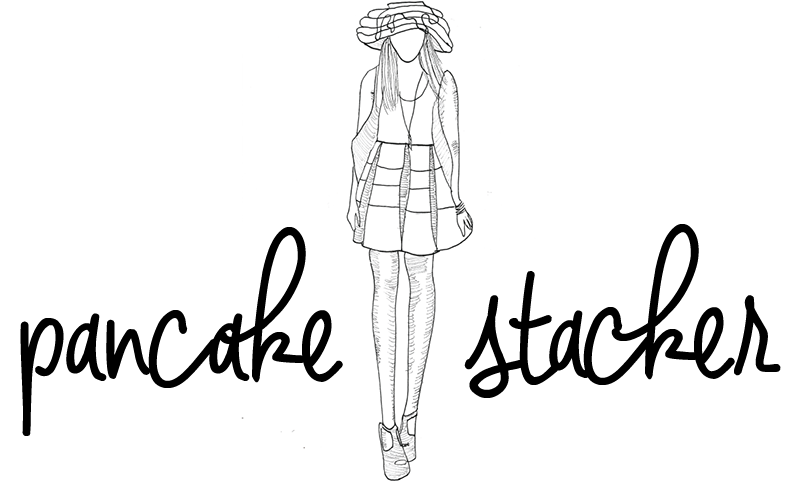 Fittingly that the nickname "Sassy Stacker" just rolls off the tongue, no? So, it was hardly a surprise when I rolled up to the first day of Outside Lands in my latest new purchase - my sassy tee. As soon as I saw this sucker online, I added it to my cart and hit express shipping, please. All jokes aside, I can always count on Lulus to hook a girl up and have just what I need when it's time to hunt for the perfect festival pieces. 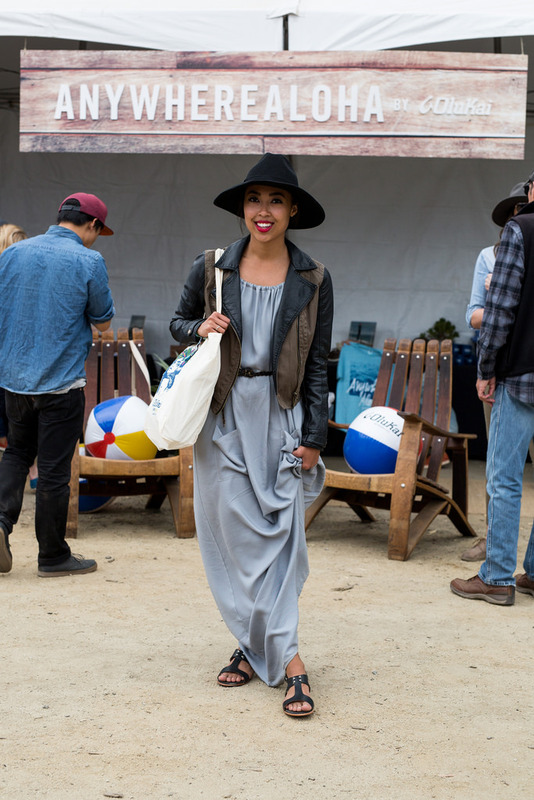 Each year at OSL, I go for easy, casual comfort. Because I knew I'd be running around all day, I decided to slip on a pair of my trusty ole distressed denim, an easy breezy tee, a flannel for layering purposes, beanie (my hat-wear choice of the day) and some slip ons to take me from point a to point b. All in all, almost everything, aside from my new tee, was just mixed and matched from something I already owned in my closet. Don't you love it when it all just comes together like that? Crunch Gym: Free Membership Giveaway! It's been a crazy couple of months. 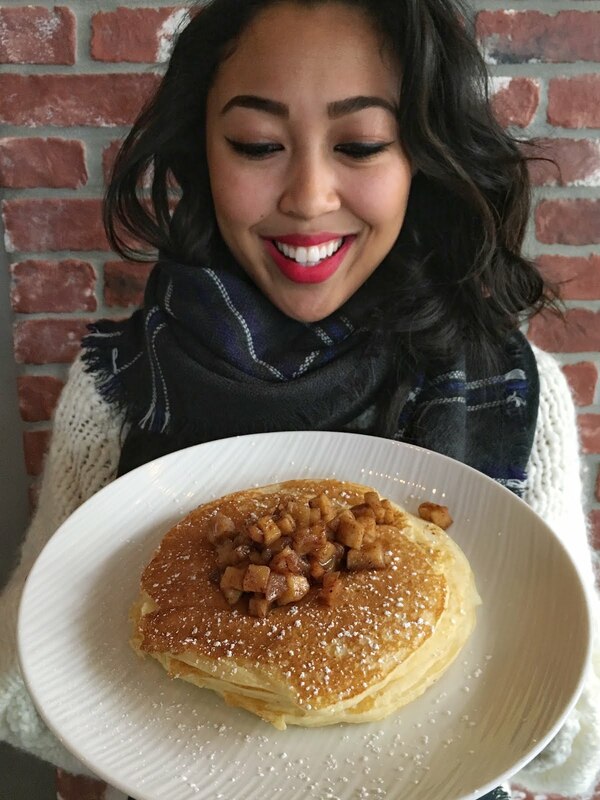 Between the long hours in the office, weekend trips and overall adult responsibilities (they're real, you guys! ), I've found myself spending less of my free time in front of the screen and more of it out and about, doing the things I love. One thing I've found myself trying to do more of is work on my fitness routine. Yes, summer trips require two piece sets and swimsuits galore, but more than anything working out has helped me take a breather from a busy day, giving my mind some "me" time to wind down. And my favorite form of "me" time? Yoga. Don't get me wrong, I love trying other workouts - from spin to dance to rock climbing and boxing - but the one thing that I always go back to is yoga. It's been a while since I've shot with my pal, Melissa, but every time we get together I get so inspired by her work. A few Saturdays back, we got together to indulge in some cream puffs (more to come on that), catch up and sneak in a quick little shoot. I've got to admit, I'm a bit rusty (been on that blog break, you know?). Luckily for me, Melissa basically does all the work, so I still come out looking much better than I could have. Since cleaning out my closet (I got rid of six bags of stuff you guys), the favorites continue to make their way into my daily rotation. Hence - you're seeing some familiar pieces, just in different ways. But hey, that's real life for ya, yeah? I'm a creature of habit and comfort, which is why I've been picking out my favorite easy ensembles and wearing them nonstop. Quite possibly the most comfortable pair of jeans I own hails from LA's own Denimocracy. No doubt you've seen them saunter across my Instagram these last few weeks (okay, months), but can't help but wear 'em out (pun intended). A month or so ago I went through my closet and noticed that all my good flats were gone. Not one to sit around and wait, I took matters into my own hands and ordered up a handful of new flats, including these grey beauties by Sole Society. Do they fit the comfort criteria? You betcha. And what's a comfy 'fit without a relaxed linen shirt? Thankfully, J.Jill continues to impress. I grabbed this casual blue and white crisp linen top from their summer collection because my closet deserved to have it.